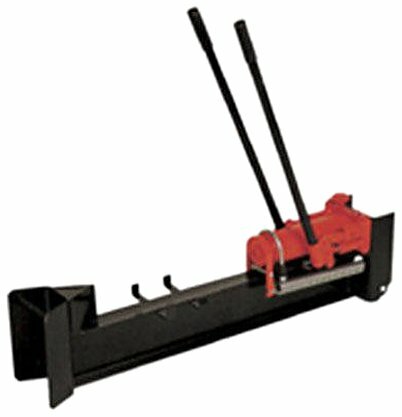 Manual Log Splitter - What Are Your Options? 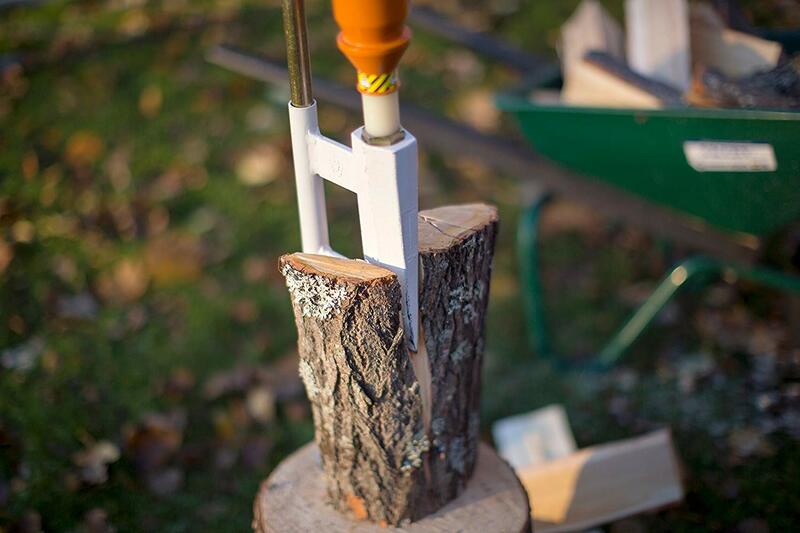 A manual log splitter is the most traditional, old fashioned way to split your firewood. No gasoline engines, no PTO from a tractor, just your energy and hard work are used to split the wood. Although this may sound tiring, new technology has helped make splitting logs by hand much easier. Manual splitters are more compact, lighter, easier to transport and cost less money than a power splitter. Choosing which type or model is a matter of preference but also depends on how much wood you need to split. There are many different models and styles of manual splitters but here are some of the most popular styles available. The splitting axe is a hand held axe designed to split the wood fibers apart and not cut them. The newer models have fiberglass handles and are lightweight, allowing you to swing them for hours without becoming to tired. 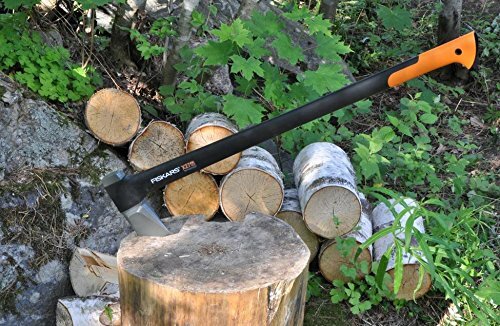 The Fiskars X27 splitting axe is a highly recommended splitting axe with great reviews. The fiberglass handle makes it light and the axe is extremely sharp. The head of the axe is designed to easily split through the toughest logs and the fiberglass handle makes it strong and durable. After years of using a maul to split firewood I purchased this splitting axe due to the amount of satisfied people who have used one. Wow.....what a nice axe. It splits great and it's much easier to swing than a heavy maul. The manual hydraulic log splitter uses hydraulics to split the wood. These splitters are powered by hand, pumping handles back and forth similar to pumping up a jack. The hydraulic piston forces the wood through a wedge, splitting the wood. The design concept is similar to the gas powered hydraulic splitter only the gas engine is replaced by you! The manual style is much lighter and cost less than a power model. The obvious downfall is the amount of time it takes to split a piece of wood compared to the gasoline model. If you do not have a large amount of wood to split, the manual hydraulic log splitter could be a good choice. The slide-hammer manual splitter uses a wedge attached to a pole with a sliding hammer action that drives the wedge through the wood. This type of splitter is compact, lightweight, inexpensive and easy to transport. It's a good choice for splitting small diameter wood, softwood, or small amounts of hardwood. The slide-hammer may take more strokes to split the wood compared to a splitting axe, but it's safer because you're not swinging a sharp blade near your body. Overall, any manual splitter will work to split firewood. The question is how much wood do you need to split and how much money do you want to spend? Just because you have a lot of firewood to split does not necessarily mean you have to go out a buy a gasoline powered hydraulic log splitter. We have split firewood for decades without the use of gasoline engines. A little sweat and the right tools are all you need!